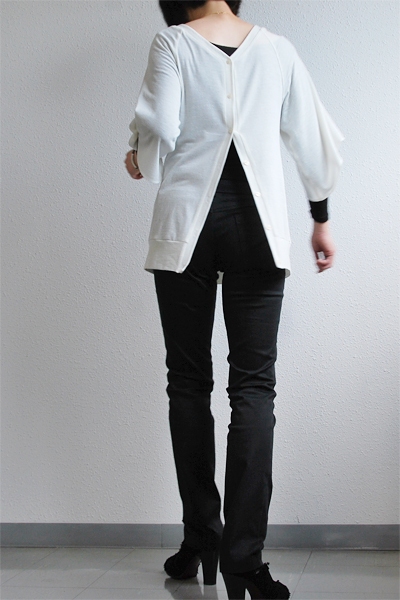 I sewed two pieces of garments lately. Probably these are to be the last two sewing projects in this year. They are nothing special but they seem quite "me", to my eyes. 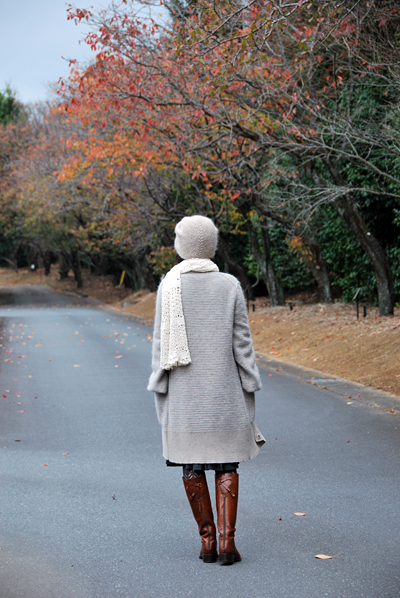 (1) I used a pullover pattern for the cardigan. 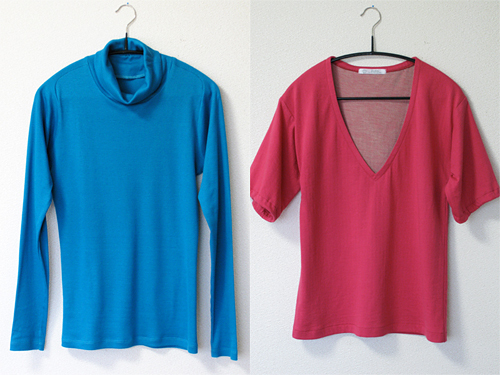 As I mentioned in this post, it's quite easy to make fitted cardigans from a pullover/jersey top pattern. I have one favorite pattern that fits me, and have been generating millions(a typical exaggeration) of cardigans from it. This cardigan is one of the millions and fits to my wintry life. 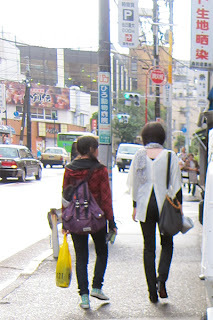 Garments in the shops are generally too short in lengthwise for me, and they tend to make me feel awkward, cold, and miserable especially in winter. As my closet has been entirely occupied by handmade clothes for some time, I'm talking about the past, though. I'm zillion times happier than ever before about what to wear since I started wearing my humble self made rags. I mean, they fit my life. -One size bigger than my usual pullover size because it's winter. -Wool/acrylic jersey. Soft, spongy, stretchy and warm. Light brown, with white tiny neps. -I growingly love this tool for button placement. (2) I recycled my old A-line skirt and sewed it into a new short skirt. This is an experiment to see how the skirt looks on me. The pattern was released recently and I found it very refreshing. However, I thought it was kinda short, and, it is quite short. But in the end, who cares, I wanted to try. I had an old skirt that was perfect for this experiment as a fabric resource too. So I checked. I find it comfortable, and I think it looks pretty when accompanied with wintry colored tights. -Wool/cotton tweed, cut from an old and tired handmade skirt. My first Linton tweed. I'll be glad if you could come back sometime in January, because there will be probably no new post in December. I wish your holiday season and the rest of this year be very delightful. I started to sew a dress called Quitterie because I liked the skirt of it very much, but eventually I had to find that I chose the wrong fabric for the bodice part. The impression of the ongoing dress looked too juvenile and I started to feel insecure. I used a yellow-ish ecru jersey for the bodice, and the dress was getting too "dolly" which I wouldn't be happy with. Then, of course, I chopped the upper half off the skirt before I completed it! I added a full lining and also fixed the zipper end for clean finishing. Though the dress-chopped-resulting skirt sits quite low on my waist because Quitterie is not a tight fit dress, I don't mind it at all. Actually, I like the fact that it made the skirt hem even lower. The fabric was polyester jersey with the black flock print. I like jersey long skirts because they don't crease much (what a practical reason to tell, but it is very important to look OK after a long desk work, I know you'd agree with me). They tend to hang nicely and softly, and I love it too. This must be a very common circle skirt in the end, but it's a very happy ending to me. It's casual and pretty. By the way, I'd like to tell you in advance that I'm not going to be available for blogging in December. I'll be traveling a lot and literally off-line in December, probably. Hopefully I can blog one more post before the next month starts, but please allow me to send you seasonal greetings now, in case I have no time to tell. I wish you a wonderful holiday season and a long lasting happy sewing! Thanks for keeping coming back to my blog, I reaaaallly appreciate it. I wish you know how much I do. I've been looking for the knitting patterns for turban-type slouchy cap for some time. Yep, you can see that I found one which I'm really happy with. I love it, my whole family love it too (they seem that they're quite amused to see me in it at home, yeah, I wear it at home, because it's fun to act peculiarly and see everybody giggling at me). Believe me, this is so cute. You may also feel to visit my Ravelry page for more info and other photographs. A shrug type jacket called Sarah, pattern from BurdaStyle. On the other day, my lovely friend Kapo bought this fabric on her holiday trip. She found it at the local fabric store and took it home with her, just because it was "SO YOSHIMI". Yes, she bought it for me. Sounds weird but I totally know how it can happen to us... Our consensus is that fabrics rule how we look (in our self-made garments) quite very much. I guess that we are concerned with them, nearly too much. Much as we are concerned, it is totally uncontrollable to encounter nice and reasonably priced fabrics, and it is also so depending on our luck. Moreover, one good found pretty fabric can be the best choice for a person, but not always the same for others. So, I can understand why she kindly thought she had to send it to me with no return when she found it. I guess she had more than the "Oh it's pretty, it would make a nice present" moment. It must have been "No way to miss the chance about perfect fabric whenever and WHOSEVER, if there is any". I was fairly sure that there was no better way for using it other than making it into a jacket which is big, simple, and something not serious. The fabric is so original by itself. It is like a sparkling pink version of fisherman's net with many thin and pretty ribbons. I bet that I can catch fish with it. So I made a Sarah in this fabric. Because the fabric was wide enough, I cut the fabric "on fold" instead of cutting two pieces for the right and left parts independently, and took the grain lengthwise too. I bound all hems with color matching woolen jersey strips in a very casual manner, and here I finished. I like this very much and would love to wear it with jeans a lot! Thank you so much, Kapo, you, and everybody else, for being there. I wish Happy Sewing to you all. P.S. Could anyone suggest me some good places for sewing related shopping in London, please? I'm going there in December and would love to visit some shops which stock sewing patterns, tools, and notions, if I can have a spare time. I'm going to research by myself too but if you have an idea about it, could you please share it with me? I'd appreciate your kind help. Thank you very much! Ta-da! I had a go on another vogue dress. To be completely honest with you, I feel like dressing very casual recently... So, I don't know how much wear I'd get from the dress (guilty! ), even though I think the dress itself turned quite pretty. However, I have a certain occasion to dress neatly and properly (than usual) in December. I may attend the meeting in this dress, so that it can bring the justice... I'll see. I had few small problems or alterations when sewing this dress, but I copy&paste my review for the pattern as it can be possibly helpful to some of you. Next time I'll post about the shrug that is in the first photo. Pullover, mid-knee length dress has loose-fitting, front pleated and gathered bodice, bands (twisted front), raised waist, A-line, front pleated and back gathered skirt, side pockets, stitched hems and long sleeves. 8-22, I made a size 8. Yes, I think pretty much so. I think so, but I personally don't like "double stitching" on jersey fabric. I used a particular thread for jersey sewing and stitched once. So far I have no problem with its durability of seams on my dress. I like the style of the dress. 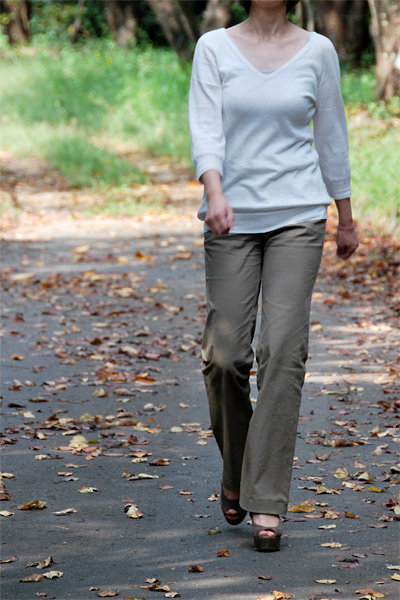 It requires 2 way stretch fabric, and that means the result achieve both nice fit and comfort. I appreciate the long sleeve, although I have shortened them quite a bit for a better proportion. I think the pleats under bust are absolutely pretty too. I am not so fond of using the elastic bands into waist bands, and I have to say it was absolutely no need to insert elastic bands in the waist line for a reasonable fitting, in my case. 2 way stretch polyester jersey, thin and a bit sheer. I omitted all elastic bands that the pattern instructed to insert in the waist bands. I omitted the pockets too. I raised the neck line about 1". I noticed that I needed a small swayback adjustment on this pattern after all. I'd try to make the back length 1/2" to 1" shorter next time, if any. I may sew this again. If so, I'd love to sew it with a gorgeous fabric for some special occasion. This can make a quite dressy dress. I'm more than happy to recommend it to you as well! I'm pretty happy with the result. 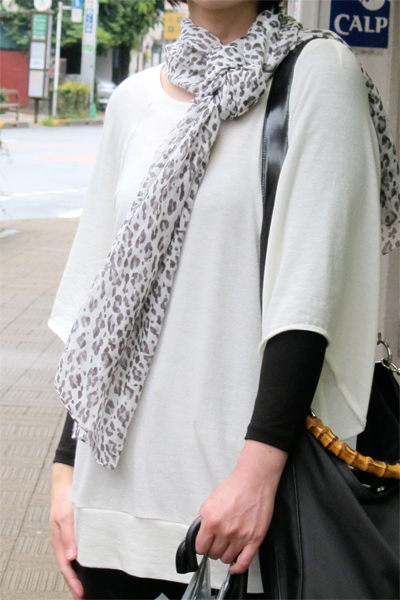 It is very comfortable to wear and very easy to sew. Great dress. These two of jersey tops are my latest creations. They were no big sewing, and they don't look too sassy either, but I'm so happy and excited to bring them into my wardrobe. I love those colors and they really brighten up my days! Hello everybody, I guess I'm on stream of pants-making! 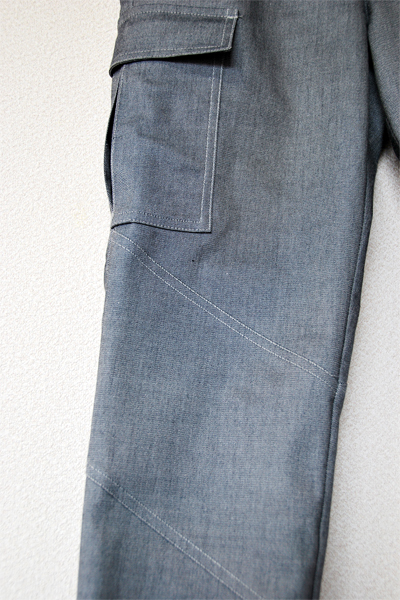 I made another pair of jeans in a grey stretch denim, mimicking the famous "Skinny cargo pants". Though I've never liked (sorry...if the words are too strong) the traditional and wide cargo pants on me, I was very curious to see if I liked them when they were not so authentic. I imagined that those stretch skinny pairs could look better on me than the authentic ones with no convincing reason, and I was too optimistic to hesitate to have a try! 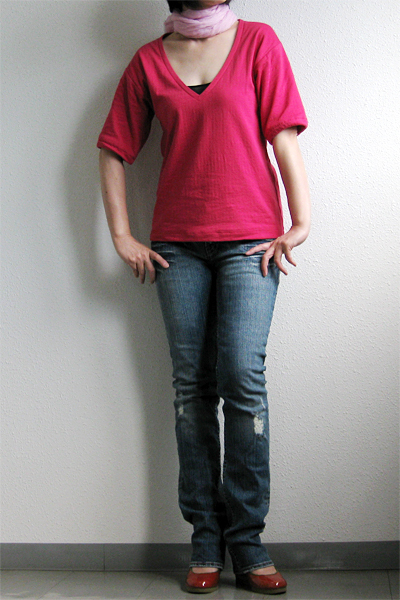 For them, I used my self-drafted pattern which I used for this pair before, and redrew the lower legs much narrower. I added pockets, extra zippers, and every detail that I had in my mind. And of course I cut the knee pieces separately. I added the lines of diagonal seams above and below the knees too. I'm quite satisfied with how they turned out, because I think the result reasonably resembles to those pairs that I wanted to mimic, I hope you agree with me! Said that, I'm not sure if I would like to wear them everyday, because I felt very shy and a bit uncomfortable in them. ...i dunno... Maybe I'm just a silly stubbornhead who cannot accept anything new. It is surely fun to own a pair like these, for a change, though. I hope you are doing very well! I made an interesting jacket on its pattern-release day. 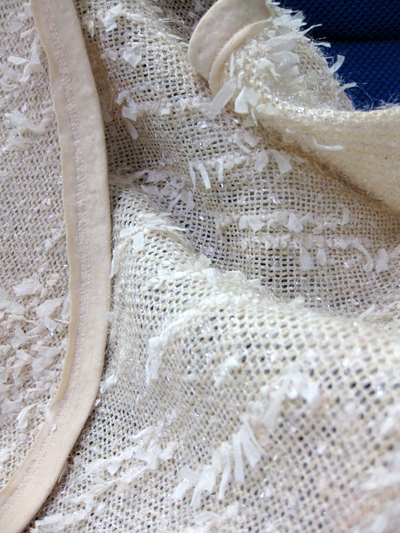 For making it, I used a synthetic fluffy white fabric, which was quite resembles to faux-fur ("fake faux-fur"??). Although the pattern recommended thinner and softer fabrics for better drapes in the front neckline, because I wanted to make the jacket look more cloak-y and very warm, I used a thick and hairy fabric which was probably suitable for overcoats. 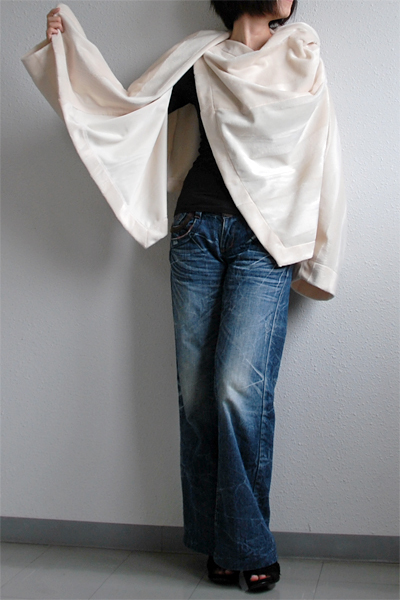 It made this jacket very voluminous, and also made it seriously eccentric. Actually, that's exactly the kind of result that I wanted, despite its pattern creator's probable wish, which was likely for a light and casual jacket. Though I'm feeling slightly guilty about it, I'm quite happy with how it turned out. Now I'm so looking forward to the cooler weather. This jacket looks a bit unconventional and you might think that this kind of garments are difficult to wear rightly, even if you could like them. However I find that, because there is no right way to put them on stylishly, we don't have to worry about how we wear them. You can wear them in any way you like, and you'll look perfect&right just because you are smiling in it. And I also find that this jacket is pretty cool because I don't have to pull it off when I squeeze myself into a car. The back length is technically too short to sit on the garment, and there will be no ugly creases created by buttock-pressing at any situation. I love it. The pattern was Rebecca from TAMANEGI-KOBO, which is currently my most favorite pattern shop, and I got it in PDF format. I have to say that, for this time, it may be a bit confusing to assemble this jacket without reading Japanese in the instructions because of the unusual construction. However I write that, if you are interested in the pattern and are also good in space perception, I'd be happy to recommend you to try the jacket because the sewing itself is technically very easy and quick. This is a jacket which is pretty fun to make and fun to wear. You can refer the technical drawings for Rebecca here as well. We had a long field walk in a highland today, and it was a great fun! I don't remember if I've mentioned my this year's resolution here. It's that I allow myself to sew as much as I would love to, unlimitedly. Before telling my this year's resolution, I think I should have explained that my new-year resolutions were always "I sew as less as possible." 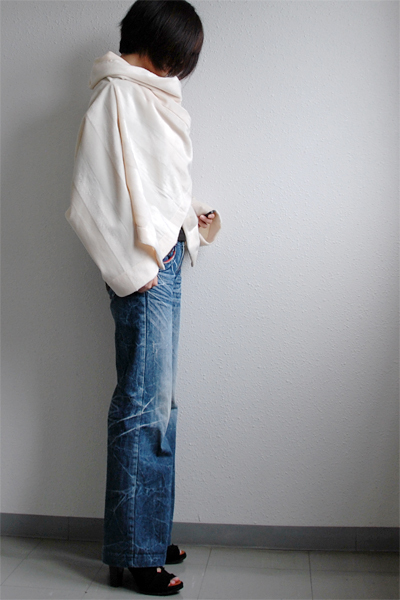 I start sewing my clothes some 6 years ago and I absolutely loved it from the beginning. However, at the earlier stage I also realized that I could easily end up with just abusing the resources on our planet by my casual and careless projects which generate useless results, for the sake of my temporal sewing pleasure. I didn't like that and took it seriously. So I've been trying to tell myself that I need to be very careful and should take a long time for planning rather than actual sewing, to avoid feeling sorry for myself creating unwanted objects in the end. I wanted to commit a minimal number of projects and wanted them all perfect. It's not my intention to oppose anybody who actively enjoys sewing or whatever other activities and creates a big number, but I hope some of you understand what I'm trying to tell you. I assume that I unconsciously wanted to sew more freely without any number limitation or garment type restriction, but I never allowed it to myself, because of my policy. Said that, I had my mind changed slightly last year. That is, I had a hard year last year. So many sorts of problems and evil thoughts visited me from all angles without warning. Everything came from outside but I didn't know how I solve them because they were, in short, not actually my own problems. However, they lasted long and discouraged me much both physically and mentally, and eventually I lost more than a stone after many wakeful nights. And then my back went wrong because of my radical losing of muscles and it tethered me in the bed for a while. However, I could stay somehow sensible but never drawn into the dark side, because I had my wonderful family and truly lovely friends around me, and I had SEWING too. I realized that I was truly positive, optimistic, constructive, calm and happy while sewing. Making things was a much more positive activity than I had thought. It surely helped me to be a better and healthier person, and I thought that it was fair enough to "consume" the resources a bit. I already knew that sewing helped me a lot to dress myself, but I had to agree that it also gave me much more than the garments. Some people say that sewing is the outlet of their creativity, but I'd say my sewing is the intake of my positiveness. Oops did I say too much? 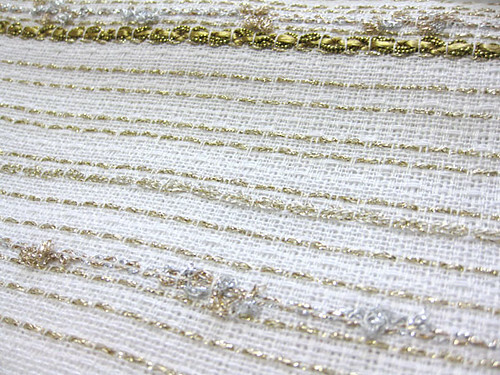 Consequently I decided to allow myself to sew unlimitedly for making me stay happy on the first day of this year. For a year only. I wanted to see how I behave when I discharge myself from the stupid self limitation. I wanted to check if I waste all fabrics in the whole world and if I yell at myself by regretting what I have done on them when I have no limit. So far it is not likely happening, though. I'm sewing more than I would really need, but it's not beyond my expectation. And I'm happy much more than I wished on new year's day. I guess I can happily reduce my projects to a reasonable number next year. I'll have more time to visit others' and your blogs, and it will be more fun! I had 3/4 year gone, and have 3 more months to go! I sew as much as I'd love to. I sew what I'd feel like. I sew what is not likely useful. I sew for volunteering to people who are in need. I sew what doesn't look promising. I sew what makes me just curious. I allow myself to sew stupidly as long as I'm enjoying sewing. 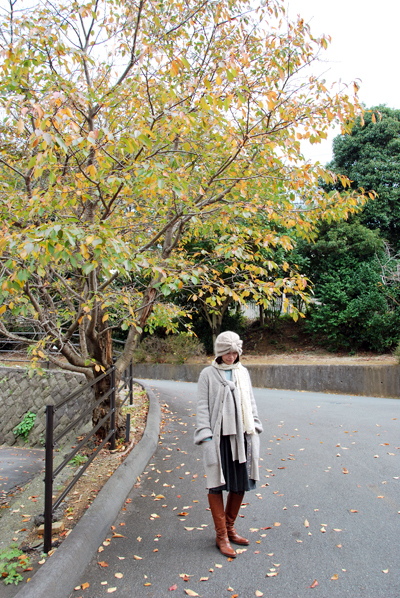 And I sewed another pair of basic pants in my favorite fabric and took my husband out for chatting under the trees on an autumn day. The post for my first Joker, in wool fabric is here. I made a jersey top with a button closure (opening?) in the back. I wanted the rear neckline of the top V-shaped, so I used the pattern Balloon from TAMANEGI-KOBO and added an opening like we normally do for cardigans at the front center. It seems that the rear view made the top interesting. I also omitted the cuffs, to make this garment "funnier", and I love the result. 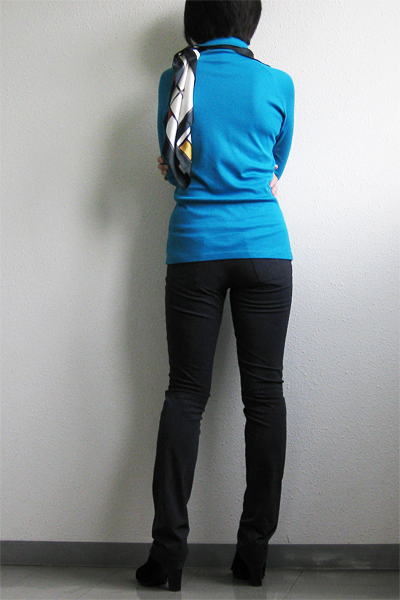 I also made a pair of slim pants in black, using Stretch skinny pants from Pumila, my perfect pants pattern. Hope you are having a good day too! First of all, I'd love to thank you everybody, for wishing our survival and for kicking out Japanese late departing summer. It's gone, it's gone now, phew. As I feel like longer and slightly fuller skirts for the coming seasons this year, I sewed this tweed skirt to fill in my list for wardrobe. It is a tuck skirt in a cotton/acrylic/polyester fancy tweed with glittering silver and gold threads. I think I can wear it until it gets too cold. The info of the patterns I used is at the bottom of this post, if you are interested. 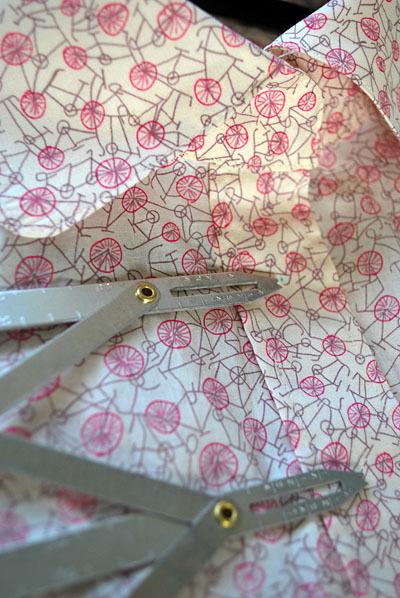 I sewed a shirt for my sister, using a Liberty fabric called Philippa ( I call it 'Bicycles' though). Unlike me, she is such a shirt wearer. I hope she will like it and get much use of it. By the way, because she is so much petit-ter than the average and I know it is difficult to get pretty shirts that fit her rightly at stores, I occasionally sew her blouses or shirts in her personal size when I feel like pretending to be kind. She always seems pretty happy with my handmade gifts but never starts to ask me to sew for her. In other words, she accepts everything and demands nothing regarding my selfish sewing. Lucky me. This is a very ordinary cotton shirt in a personal size and I have nothing spectacular to tell about it. Instead of telling you a boring poem today I'm going to tell you about a tool I met. I recently happened to find it at Vogue Fabrics, and impulsively placed an international order for it. 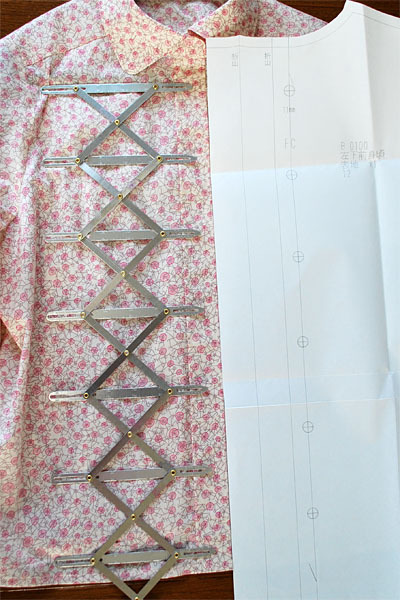 I imagine some of you don't understand why I was so very interested in this tool (actually I don't know exactly why either) because there is only one simple calculation between one front edge and certain number of buttonholes. It's very capable for anyone to place buttonholes without this specific tool, but I am glad to have it in the end. 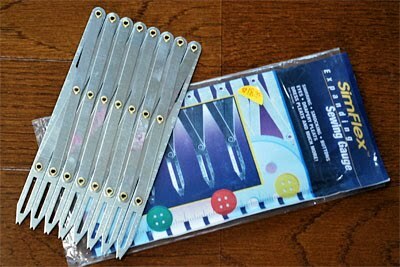 I am usually very reluctant to get new 'useful' tools, especially for sewing, because I'd feel so uncomfortable when I am surrounded by those 'useful' tools which are never used except occupying my drawers. So, most of the time, If I can do without, I'd definitely choose without. That's my rule. However this time, I bought it and found that it was so easy and stress-free to mark for buttonholes with this gauge. I'm about withdrawing my possess-as-less-as-I-can policy for it. 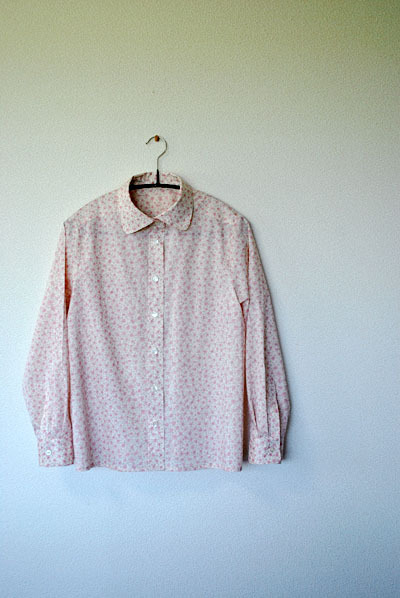 If you are loving shirts or having a sweet sister who loves clothes with many buttons, the tool is likely to be useful without making you think it is occupying your precious space in the sewing room. Let me remind you that cardigans have many buttonholes too. I learned that it was good to be more open-minded at last. I'm probably not talking about a tool. I guess I'm mumbling about an attitude to myself. I'm sewing for autumn, although it's still sweating hot everywhere. 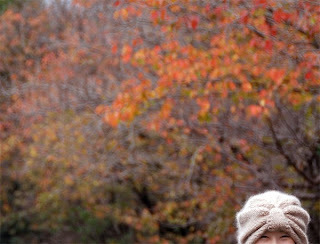 Our Summer 2010 hasn't been over yet at all, but I am pretending that it's getting cooler day by day. Actually, we are having the hottest and longest summer in the last hundred years here in Japan, and it's kinda surprising (maybe I should say "it's funny" instead) that I am able to feel like autumn sewing, in this heat. 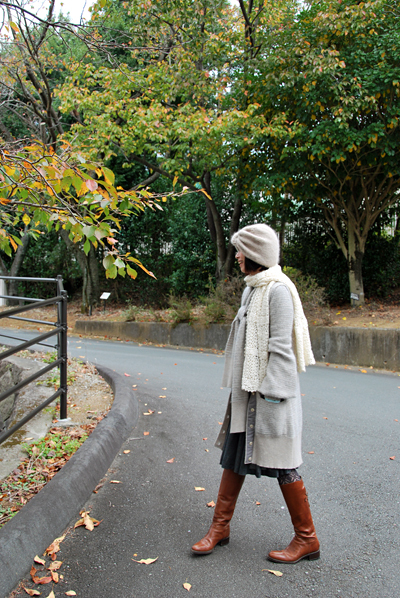 I sewed these pants in this pretty and beige wool as a part of my autumn outfits. I got a pattern named "Joker" at the sale that I mentioned in the last post, and used it for these pants. I think my Joker turned feminine and not too casual, probably because of the fabric I used. 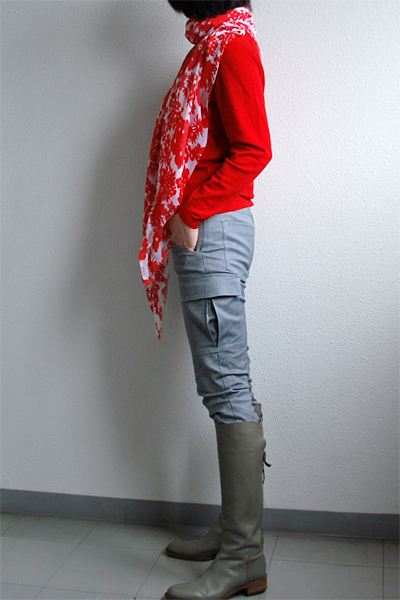 It was a nice (but not too nice) quality wool fabric, and I love its result at all. 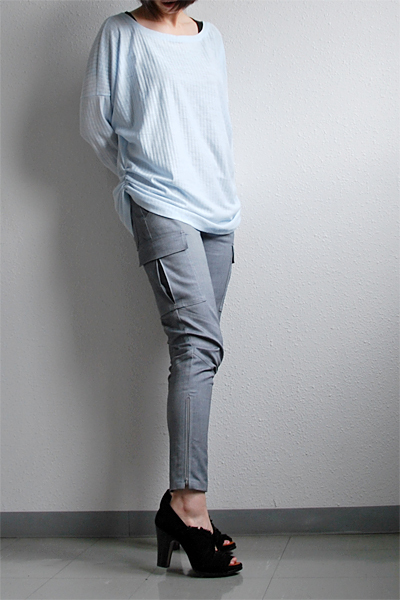 I think that these pants look quite lovely, even though they look *technically* nothing special. Actually, I love it even more when it happens. I mean, it makes me happy when I see something lovely in "nothing special". I believe that nothing special can be special with indescribable reasons. *gasp* I'm so incapable of writing. Before I put all sorts of quotation marks everywhere, I shut up. Hope you are having a pleasant weather.